A new study published in the Ghana Medical Journal sheds light on the drinking habits of pregnant women who choose to drink during pregnancy, despite potential pregnancy and fetal complications. The study examined the drink of preference and drinking habits of women in Ghana. While the society in Ghana is different than that in the United States, researchers did reveal a small piece of information that could help doctors and researchers formulated better educational tools to reduce the number of women who drink alcohol during pregnancy. According to the research, the majority of the 397 pregnant women studied chose to drink before meals and only at home. The fact that the pregnant women chose to drink at home could mean they know drinking is an inappropriate behavior, but feel they need to drink or feel they need to avoid public interaction when they choose to drink. The pregnant women clearly care about how others perceive their drinking. If stopping is a problem, women need to be educated on alcoholism support groups and programs available to pregnant women. If they are simply drinking at home to avoid public perception, they may not have the information needed about fetal alcohol syndrome (FAS) and other complications of drinking during pregnancy to change their attitude about drinking during pregnancy. Source: Adusi-Poku Y, Bonney AA, Antwi GD. 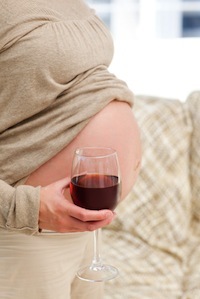 Where, when and what type of alcohol do pregnant women drink? Ghana Med J. 2013 Mar;47(1):35-9.